Now celebrating our 13th year on Vancouver Island! Celebrating diversity and cultural understanding fuel our creative passions at MoonDance. Through our local community, as well as in Africa and around the World, MoonDance offers respectful, culturally-sensitive classes and workshops. "There are few short-cuts to happiness... DANCE is one of them!" Lynn has been dancing all her life and loves sharing her passion for dance. She is an educator, performer, director, and advocate of human potential. Her training includes Decidedly Jazz Danceworks, University of Calgary, and studying with master dancers of Les Ballet Africains, Percussion de Guinea, and Ballet Saamato. She has studied extensively across a range of disciplines, specialising in Cultural Dance, specifically West African Dance and Drumming. Her recent choreography and performance work includes Tribe of One, Coco Jafro, and the Art House Collective. Lynn owns and operates MoonDance Dynamic Arts School, and is Chair of Matoto Multicultural Arts Society. She reaches broad audiences to share the Arts and cross-cultural understanding. She collaborates regularly with Power of Hope, Canada World Youth, Cowichan Intercultural Society, and other leadership groups on Vancouver Island and abroad. Lynn is co-founder of Inspire! Shawnigan: Arts, Culture, and Heritage Society. Danny was born in Quibdo, Colombia and began studying Contemporary African dance under director/choreographer Rafael Palacios 7 years ago. He was a member of the group Sankofa for most of that time and with it performed throughout Colombia and internationally until moving to Canada in 2007. Nikko has been dancing with MoonDance for 6 years and is thrilled to have the opportunity to teach with the school. She began exploring dance at an early age through ballet, character, jazz, musical theatre, latin, swing, flamenco and most recently West African dance. She is also a certified teacher, environmental educator and mother of two young children. Gen took her first creative movement class at 6 and went on to study ballet, jazz, modern, tap, flamenco, musical theatre and, most recently, West African dance. As an adolescent, she was a member of Kidco Touring Dance Company in Victoria, and won a number of city-wide dance awards. She went on to study theatre at UVic, and performed extensively in both amateur and professional theatre productions. She was a member of Alma D'Espana, and has studied extensivly with Lynda Raino, dabbling in both choreography and directing. She is currently an active member of the national award-winning Balkan Babes, has a homestead in the Cowichan valley and is raising two small boys. Gen loves rhythm and movement, and believes music and dance are inextricably connected. Chris has recently moved to Vancouver Island. He has an MFA in Interdisciplinary Arts from Simon Fraser University. While primarily focusing on dance and creative movement, Chris also incorporates sound, installation and theatre within his overall artistic practice. He has danced in companies in various cities throughout North America spanning a range of styles — from highly physical dance on scaffolding to an intergenerational dance company where the oldest member was 90 years old. He has danced in alleyways, living rooms, on and under bridges, in prisons, in old age homes, and most places in between. For the last few years Chris has been an arts educator at the Vancouver Art Gallery, led and organized Soundwalks for Vancouver New Music and taught creative movement in elementary and secondary schools throughout the lower mainland with Learning Through the Arts. Abou hails from Guinea, West Africa, where he trained and performed with professional dance troupes in Africa and Europe. After coming to Canada in 1995, he toured coast to coast with a Vancouver-based African group, and in 1997 started his own group, Doundounba. He mingles musical traditions, from ancient Guinean rhythms to dance-driven highlife. His mandate is staying true to yourself and your principles, being kind, and feeling good! Formerly from California, Farideh (Cathryn Balk) has been dancing professionally for 40 years. Her classes in traditional North African, Middle Eastern and Flamenco forms, emphasize refined technique and educated understanding of the music to create relaxed and joyful dancers. Farideh breaks down the various dance movements into a series of micro-steps that even the beginner can accomplish. This allows the dancer to progress quickly to the intermediate level. She is committed to preserving traditional styles and respecting the origins and cultures of the art form. The dancer is also encouraged to understand the basic rhythms so that he/she may learn to develop their own unique interpretation of the music so the dance is both adaptive and personal. See www.institutefortraditionalstudies.org/faridehdancearts.html for a more extensive biography. Jung-Ah graduated from the Ewha Women's University in Seoul, Korea, appearing in Empty Space at the 4th Recontres Choreographiques Internationales De Seine-Saint Denis, she was awarded a Best Dancer's Prize. She also performed for Ae-Soon Ahn in 1998 in the Grand Prize of the Centre Internationales De Bagnolet in Paris. Since she moved to BC and has worked with Constance Cooke, Ballet Victoria, TriPOD Dance Collective, Out of the Box Productions, Suddenly Dance Theatre, Wen Wei Dance and Battery Opera. Recently Jung-ah's solo Connection is invited to Tangente 08 in Montreal, CanAsian Festival 09 and Guelph Contemporary Dance Festival 09 which she created for Pulse at the Dance Centre and Dancing on the Edge, ROMP 2006. She also participated in Suddenly Dance Theatre's film Nature ecstasy and Opium and Aisling for Bravo and directed, choreographed and performed in her first film Drive in 2005. She toured with Suddenly Dance Theatre three cities in Korea in summer 2008 and was invited for The 10th Next Wave Dance Festival. With her non stop versatile performances she was chosen as The Victoria's Favourite Choreographer in 2006 and the favourite Dancer in 2004 by M-Awards, Monday Magazine. She will continue to dance in gratitude with the mind of infinite possibility. MoonDance partner and musician, Byron brings explosive energy to the classes. A guitar player for many years, he began his study on the intricacies of West African drumming six years ago. As a dancer, choreographer, writer, producer and dance educator, Laura's career in the performing arts is a reflection of versatility and experience spanning 30 years! Laura's teaching is informed by her work in Musical Theatre, Las Vegas production shows, industrials and TV. As co-founder and Artistic Director of Diversity Dance & Theatre, Laura is best known for her work with youth and creating educational arts programs which combine the dynamics of dance, music, and drama to inspire personal growth and positive social change. Lori Hamar began dance training in Edmonton, Alberta and continued with professional training at LADDMI in Montreal, Dancers Studio West in Calgary, MainDance in Vancouver and various summer programs in the U.S. She quickly discovered her drive to create as well as perform and has honed this craft by co-founding three different companies to date; Motivity Modern Dance in Fort MacMurray, AB, Suddenly Dance Theatre, and triPOD dance collective in Victoria, BC. Lori began teaching preschool children improvisational dance in 2009 and integrated dance in 2005. She served as Acting Artistic Director for Holly Bright with the Crimson Coast Dance Society in 2006/2007. Lori currently works as an independent dance artist while continuing the facilitation of children's improvisation classes. Lori is eager to continue creating new danceworks and contributing to the exquisite art form. The CRD, BC Arts Council, and Canada Council have supported her work at one time or another. After practicing yoga for most of her young life, Robin felt that taking yoga teacher training was naturally the next level to deepen her own personal practice. And even though her intention was not becoming a teacher necessarily, halfway through her training she was provided with an opportunity to begin teaching classes. She decided to listen to the signs and took it. That was in 2006. During her journey, Robin feels honored to have the opportunity to be able to share the teachings and knowledge from her teachers and her teacher's teachers. Robin feels that Yoga and dance provide her the time and space to reevaluate her earth life and to be open to the ever evolving 'purposes' that life presents. Always on the go in one sport or another (rock climbing, snowboarding, running, swimming, cycling, various team sports), Erin had never considered herself the "dancer" type. It was quite a surprise when she discovered how quickly she became drawn into the class and the rhythms of West Africa. Erin is testament to the fact that you don't have to be a "dancer" in the traditional sense to fall in love with West African dancing. In fact, she openly admits her only "dance training" involves impromptu polka-fests in the family kitchen. While the winds of change have moved Erin to Kamloops, Erin remains an integral part of the MoonDance family and of Matoto. Juno award-winning percussionist from the African Guitar Summit, and the legendary National Ensemble of the Republic of Guinea, Naby's talents are not only balafon and djembe, but he is a skillful teacher as well. Dynamite dancer, N'nato's credits include: Ballet Taille, Circus Baobob, and Aklysso. Through study and performance with prestigious artists and performance groups: Ballet Saamato, Merveille de Guinee, Sekou Sylla, Karamoko Daman, and Bolokada, Manimou has a wealth of knowledge and enthusiasm to share with students. Laura is a musician and dancer, and found Moondance back in 2003. 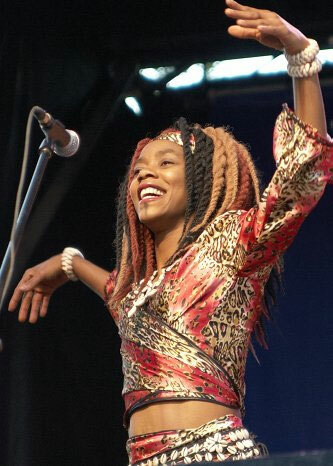 Her musical upbringing included RCM piano and theory training; drumming in school bands and an Ottawa-based ska band; singing in pop/rock groups and folk and classical choirs; and drumming, singing and dancing with Moondance's performance troupes Keyke Fare and Wontanara. She's currently performing with the local folk/roots group The Ramble, and is excited about drumming again for Moondance classes in Victoria, as well as sharing the joyful process of singing, at the Art House in Shawnigan Lake! Wontanara! 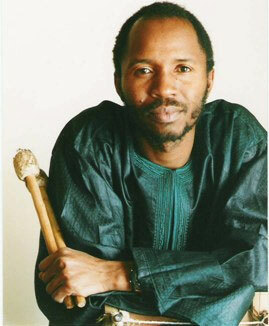 Alseny "Michel" Diallo is a master djembe player and talented performing artist from Guinea West Africa. He has been working in the Guinean Music scene for over 15 years, performing in different ballets, participating in festivals and competitions as well as showcasing in Guinea's largest theatres, "Le Centre Nimbia" and "Le Centre Culturel." Alseny Diallo has been the lead soloist djembe player for various ballets since the age of 12, now at 27 he has become the artistic director of several ballets, earning him a master title. Alseny's musical talents has also led him to perform at many significant cultural events with such ballets as "Le Ballet Taille", "Les Ballet Africain Juniors", "Le Ballet Kokuri", "Le Tempo" and "L'Oiseau Blanc". In 1997 Alseny participated in a national annual competition, "Festi Kalum", where their ballet received a natioanlly accredited diploma. In 2004 "Le Ballet Taille" took part in "La Tour Federale," a governement funded collaborative project bringing together 10 different established ballets from Guinea. Alseny has been in Canada since 2007 performing and touring with internationally acclaimed artist Alpha YaYa Diallo and his own group Kikeyambay. He has a gift for sharing the music of his culture and is an amazing teacher having taught djembe and duns throughout BC and Africa. Monique Salez is a multi-disciplined performer, choreographer and teacher of movement whose roots and deep passion lay in the art of flamenco. Her unique style stretches the genre by fusing it with elements of modern and hip-hop. A recipient of a professional development grant from The Canada and The BC Arts Councils, she has traveled to Spain and studied with many flamenco greats from Belen Maya to Israel Galvan. Monique teaches and performs across North America creating award winning choreographies with her flamenco cuadro FLAMENCO REBELDE, collaborating with diverse companies from Ballet Victoria to Bella Canto and most recently, launching her flamenco fusion band EL SHOW. She nurtures a thriving flamenco program at Lynda Raino Dance in her home town, Victoria. Since opening Woodruff Music School over 16 years ago, Jennie has provided a unique music program for an ever increasing number of children and their families. Her warm, loving and relaxed approach with students, and her comfortable cottage studio in its garden setting create a very special music experience. The philosophy surrounding the music program is one of connection and relationship building, in addition to developing a passion for making and sharing music. Jennie holds a degree in Education, specializing in Early Childhood and in Music, and has 28 years of experience teaching children of all ages. She has performed in a number of musical ensembles including The Mere Minstrels Trio, and currently with Mtoni Malaika Marimba Band. Her creative and nurturing teaching style encourages even the most hesitant youngster to join in with the activities, and her passion and enthusiasm for her work shines in the joyful musical expression of the children. For Kesseke dance is like a medicine. He started dancing at 7 years and at 11 he went to the Ivory Coast National Ballet and was there for several years dancing locally and touring around Africa and Europe. 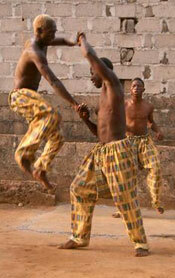 He also danced for Yelemba d'Abidjan and Ballet Djolem d'Abidjan, la Companie de Wouafou de Abidjan. In 2001 he moved to Vancouver and currently dances for Masabo Culture Company and his own group West meets West. He also teaches West African dance in various dance studios in Vancouver (www.KissofAfrica.com). Allan has been a drummer since he was 10 yrs old coming up through school bands, dance bands and musical theatre. He did 2 years of music at Malaspina College as a percussion performance major. He has played drums & percussion in formats from symphonic to jazz, kit drumming, big band and of course rock. West African music is his current drumming choice and Allan started playing dejembe 5 years ago. It is almost 3 years since he started playing with Moondance. He started studying with Navaro Franco and now with Jordan Hanson for over 2 years. He has also attended numerous workshops put on by visiting African drummers. On the other side Allan has a varied seagoing career of 32 years. He started in Victoria with the Coast Guard and moved to the east coast and beyond. He particularly enjoyed the Canadian Arctic and spent 22 years in the north on ice breakers, tankers and supply boats. He joined BC Ferries in 1998 and has been Senior Master on the Queen of Cumberland (Swartz Bay) since 2000. Allan and his wife Donna have been together since 1977 and Peter (19) is their only son. Juliana was born and raised in Prince Edward Island, and has had a sincere interest in music, art, and nature for as long as she can remember. She moved to Victoria in 2003, and graduated with a Bachelor of Arts degree in Geography and Environmental Studies from UVic in 2007. As a kid she dreamed of playing the drum set and the xylophone. At the age of 12 she received a guitar for her birthday, and her family bought her a drum set at age 13. In her early 20s, she began playing djembe and douns, as well as dancing, with MoonDance. She has performed as a drummer, guitarist and vocalist in a variety of bands over the last sixteen years — including jazz and concert bands, as well as rock, punk, folk, and alt-country bands — and is currently a drummer and dancer with the MoonDance performance troupe Keyké Faré. Between December 2008 and January 2009, she had the incredible experience of traveling to Guinea, West Africa to study traditional Guinean drumming and dance with members of Ballet Saamato in Conakry. She looks forward to returning to continue her studies, as well as her involvement with future and ongoing projects started by the Matoto Multicultural Arts Society, of which she is a founding member. Ken Tupper has been playing djembe with Moondance Dynamic Arts since 2004. In addition to percussion, Ken plays acoustic and electric guitars, the hammered dulcimer and sings. Ken's interest in West African music began when he had the opportunity to learn African-style guitar from Alpha Yaya Diallo. Ken is working on his Ph.D. in the Department of Educational Studies at the University of British Columbia and is currently employed at the BC Ministry of Health, doing population health policy. He is also an avid telemark skier. For more info, see www.kentupper.com. 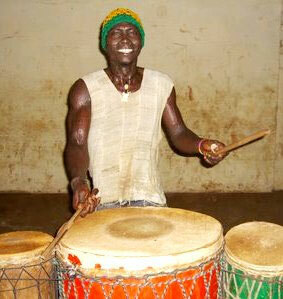 Pete began drumming while living in Ghana in 2004 and was hooked! After moving back to Canada in 2007 he discovered MoonDance and has been stoked to be drumming with them ever since. Josh received a drum for his 12th birthday. Djembe class with Byron got him hooked and Josh has developed into a passionate West African drummer. His short term goals are to play as best/fast as he can, and earn enough for a bigger drum. His long term goal is to travel to Guinea to further his training. Now at 13 years old, Josh's other hobbies are collecting Lego, water skiing, and gymnastics. MoonDance is also grateful to have others sharing their talents and energy!